HealthHUB pilots offer more health care services. 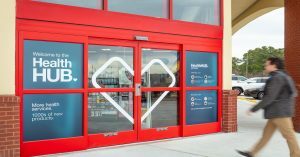 HOUSTON — CVS Health has unveiled a new health-focused store concept here that’s designed to help the pharmacy chain become more of a health-care provider. The three HealthHUB pilot stores that opened in the Houston area in December are part of the company’s vision for its $70 billion acquisition of health insurer Aetna. In addition to the pharmacy, each store has an expanded health clinic, with a lab for blood testing and health screenings. There are also wellness rooms for yoga and seminars, dietitians and respiratory specialists in the HealthHUBs. More than 20% of the floor space at the concept stores is devoted to health care services, including wellness products and personalized care. Pharmacists in the HealthHUB stores will also make regular calls and in-person consultations with certain patients to help them stay on track with their prescription drug plans. Consumers can check their blood pressure, weight and body mass index at a kiosk inside the store. They can also consult with a dietitian, who can connect them to Noom, an online weight-loss service. CVS will use the three HealthHUB pilot stores in the Houston area to test the new services. Hourican said CVS won’t turn all of its stores into HealthHUBs but will likely take individual pieces and roll them out across more stores if they’re successful. 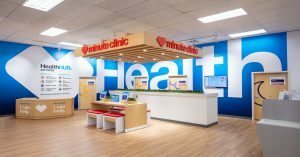 “We’re pleased and surprised pleasantly with the ecosystem of health care that we’ve created here and how approachable it is, how much people are interested in it and there are certain things we can take to all stores,” Hourican said.